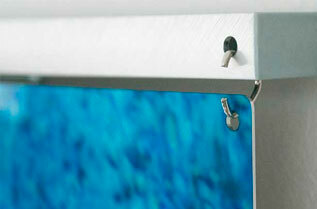 The aluminium collection of photo panels have small holes in the aluminium. These photo panels can then be connected to each other by means of brackets. This makes it possible to make very nice large photo collages, which leads to a very impressive result. It is possible to print a photo on several photo panels, it is also possible to sublimate a different photo per panel. Fun for restaurant / snack bar to present a menu. The photo panels can be easily disassembled so that the order can be changed. 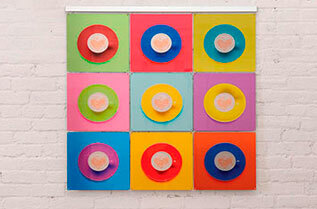 There are countless possibilities to use a photo collection as a fun / beautiful marketing tool. 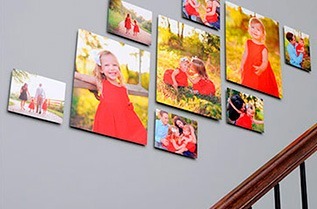 The ChromaLuxe photo collection panels can be easily connected to each other. This way you can put together your mosaic collection in unlimited width and length. 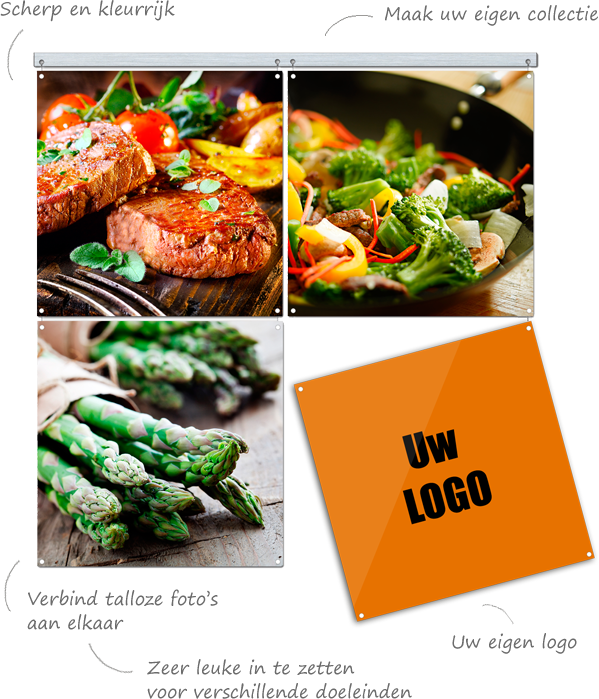 The panels can each have their own photo, but it is also possible to sublimate a large photo across multiple photo panels! Print various photos of work, logos, logos, staff on ChromaLuxe photo panels. A collection can always be completed afterwards by ordering a photo panel separately! These photo panels can be attached to each other with brackets. 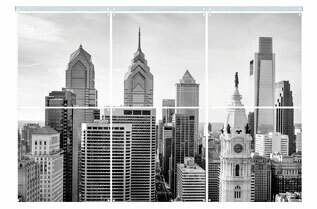 It is also possible to print 1 large photo on multiple panels. A photo collage is excellent for use at fairs where you want to distinguish yourself from others. An aluminium photo panel for a photo collage has a hole in every corner. The panels can then be connected to each other by means of suspension hooks. 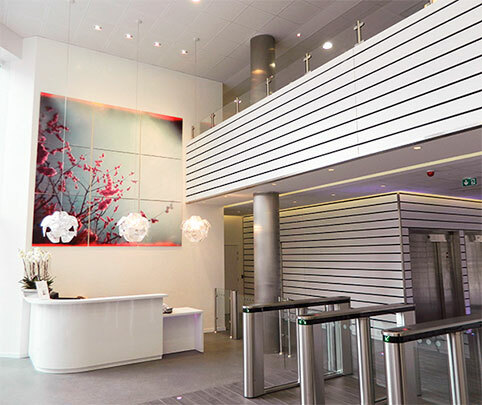 The aluminium photo panels are suspended on an aluminium beam, which is attached to the wall. Three aluminium photo panels can be attached to this beam. You can hang several aluminium beams next to each other, so that a photo collage can also be made larger across the width. For high quality art printing and professional photos. Ideal for sale, gallery or exhibition. More information about printing on aluminium? Do not hesitate to call or request a quote from us. We will gladly help you! The sublimation technique in combination with the tight coating of ChromaLuxe gives the photo on the aluminium a sharp look compared to printing on e. g. dibond. The photo should therefore also be delivered with the highest possible quality for perfect sharpness. The colors on an aluminium photo panel of ChromaLuxe are very bright. The high gloss finish makes a photo come to life! 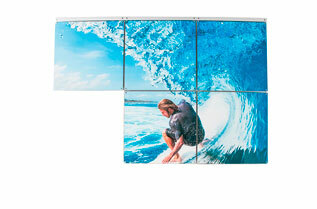 The photo panels have a beautiful high-gloss finish and this creates a 3D feel. Dye sublimation is a chemical term of a phase transition from a solid phase to a gaseous phase. This refers to the ink which takes a gaseous form at a high temperature and pulls it into the coating on the material. We have different coatings and materials on which we sublimate. For example, we sublimate on aluminium, wood, mdf, glass and glass. Is dye sublimation technique new? Dye sublimation has been around for a long time and is used in the manufacture of building materials and facades. It is less well known in the private market. The product on which sublimated is new. ChromaLuxe has developed a coating that has a nice gloss, which makes photos very sharp. The combination of ChromaLuxe coating & sublimation technique results in a brilliant result. ChromaLuxe is a brand name and was developed by Universal Woods. Universal Wood is market leader in developing sublimation products. They therefore have the right knowledge and experience to make a nice coating. This new coating is used on various materials. The coating is also used on aluminium, wood, mdf and hardboard. All products that have the coating are covered by the ChromaLuxe label. We try to deliver the product within 7 days. We do not have custom ordered products in stock and therefore the delivery time may take longer. In order to save energy, we collect orders and print them on a certain day of the week. This day depends on the number of orders. We want to be satisfied customers and we want to achieve this by providing good service and building a relationship. Do you also have other top layers? ChromaLuxe offers several finishes on the aluminium. The aluminium is available with a white top layer and a transparent top layer. The top layer can be finished in gloss, semi-gloss and matte finish. In total six different types of coatings. Each coating gives a different effect. What is the difference between sublimating and printing? In the case of sublimation, the ink is applied to the aluminium in the coating layer. The coating layer is moisture resistant and scratch-resistant. For direct printing, the ink is applied directly to the aluminium. In what quality should I supply a photo? A photo on aluminium is different from a photo on canvas. Canvas has a coarse structure which means that photos are also printed with fewer pixels per inch. 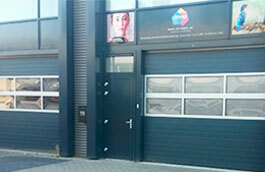 For an aluminium photo it is important that the photo is of the best quality. An image is enclosed in the coating on the aluminium. The coating is easy to clean and scratch-resistant. By opting for sublimation, you choose durability.